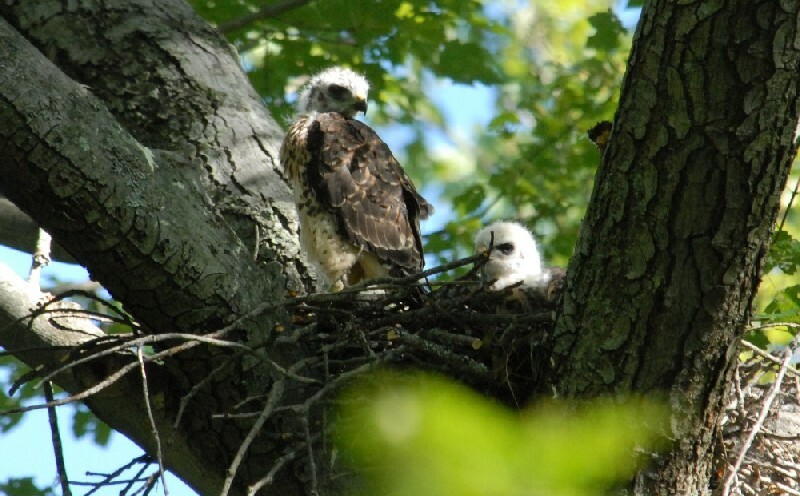 On June 27 I was Atlasing in Boston North 1 when I heard some robins fussing, so I followed the sound, and was delighted to discover this Broad-winged Hawk Nest. 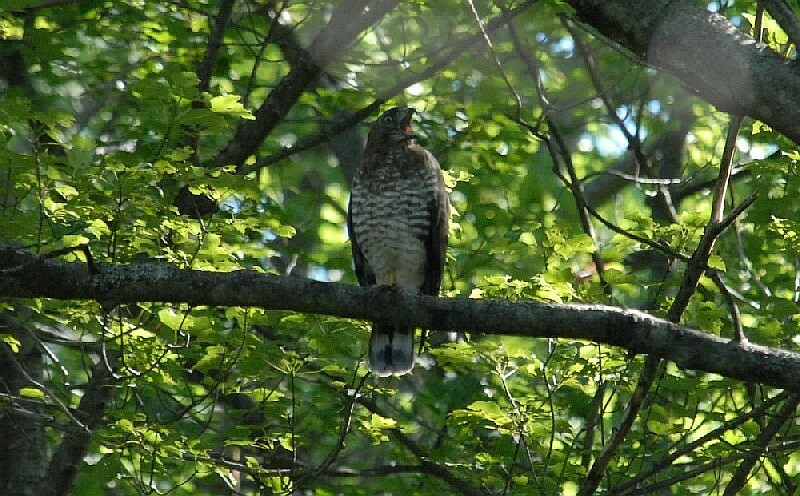 It was located in plain view of a bike path, and I was able to watch often as they grew. The wait seemed interminable. Every time I checked the adult was still on the nest, and it wasn't until July 22 that I finally saw signs of progress when I watched the adult bringing food to the nest. On July 27 I saw the chicks for the first time, small and downy white. Just a week later on August 3 you can see some of the juvenal feathers coming in. They have grown considerably and are much more active. On August 9 they are well into juvenal plumage - you can even see a glimpse of tail feathers. August 13 the head feathers on the left bird seem further along. It's interesting, but the chicks didn't seems to change places in the nest. It was always the chick on the left that seemed slightly more developed. It was also on August 13 that the left chick climbed out of the nest and its sibling spent some time preeing its breast feathers. On August 16 the chicks had both fledged, but I noticed one nearby. I watched it for a while, and it often would open its bill like this, but I couldn't hear anything. On the other hand, I could certainly hear the adult. Almost every time I walked down the bike path I could see it perched a short distance away from the nest, and it frequently vocalized.